Arlo Faria and AJ Shankar — were PhD students in Computer Science at UC Berkeley. Arlo and AJ had built a stunning new way of doing product discovery for soft goods. I define soft goods as the category of goods where you’re shopping based on the appearance of the goods (for example, shoes, clothing, sunglasses, watches, jewelery and furniture) rather than the specifications (most consumer electronics fall into this category). 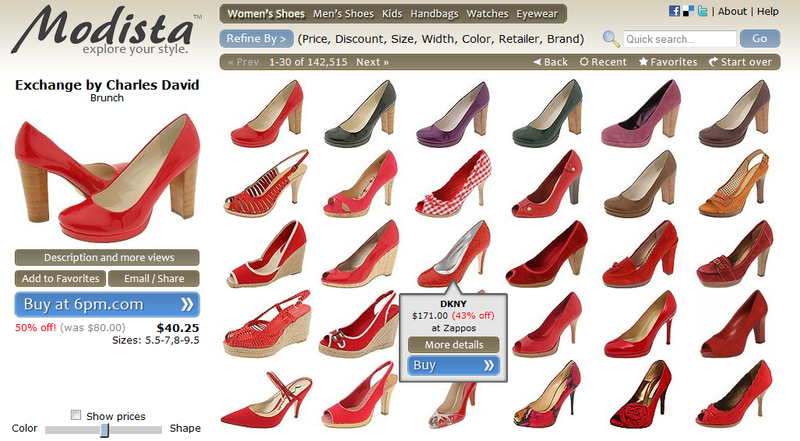 It created a fabulous experience for browsing soft good inventory based on what you’re visually looking for. In the user’s mind he or she would be thinking, I want a red shoe, with high heels, but you don’t need to translate that into keywords, you just click on what you like till you get closer and closer to what you like. Progressive refinement at its best.